No, I’m not writing picture books now. But my friend has! This is my friend whose daughter was the inspiration for the developmentally challenged sister of Ginny, the heroine in my first published book, Deep Cover. I was so excited to receive Jesus, Let’s Talk as a gift to share with my grandchildren. The book was created to help children, early readers, and people with developmental differences enjoy the sweet basics of conversation with Jesus. This natural approach to prayer is truly inspiring. The colorful photographs of children and young people were specifically chosen to celebrate that the fingerprints of God are on all people, all around the world. The book also highlights key words using American Sign Language. This allows little ones who are not yet talking, or those who experience hearing impairment to express themselves, as well as those who simply want to have fun learning new ways to communicate. My grandchildren (ages 0 to 6) are captivated by the photographs of real children and love to learn the “signs” for the words depicted on each page. Our two-year-old, who usually rapidly turns to the next page before I can finish reading the one we’re on, didn’t do that with this book. He studied each picture, attempted the sign language I taught him from the page and listened to the simple prayers. They are wonderful examples of how to pray and demonstrate how to view ourselves through God’s eyes. The pictures were also a springboard to interesting discussions with our four- and six-year-olds about the challenges some children and families face. 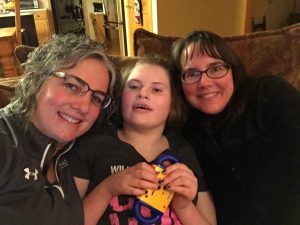 The author is Lisa Jamieson who, alongside her husband, parents a grown daughter with special needs and is a national disability ministry leader. She is also a speaker and the author of Finding Glory in the Thorns and related Bible study materials. Jesus, Let’s Talk is her first children’s book. The photographer is Ann L. Hinrichs who serves missionaries worldwide, while enjoying the arts as a musician, worship leader, voice teacher, and international photographer. This book would be a wonderful gift to any parents or grandparents of young children, or children with special needs, or to the children themselves. It would also be an excellent resource for Sunday School classes and in the primary classroom of Christian schools.